Shockingly we won’t have a three-peat champion in Major League Soccer for the first time ever. Why? Because the Houston Dynamo failed to get out of the first round of the MLS Cup Playoffs this year. Weird huh? No Houston in the MLS Cup may actually be a good thing for the league though. It’s just tough for Houston fans to not be able to bring up talks of dynasty or things of that nature. What will they talk of next is the Expansion Draft that is in a couple weeks. No one expected to see them exit so soon in the playoffs this year but so is life sometimes and the Dynamo will have to face that fact like every other team that is in their position. And as always to get caught up on who we’ve gone through so far, here are those clubs: Chivas USA, Colorado, DC, Dallas, LA, Kansas City, New England, San Jose and Toronto. And of course, to recap about the rules, go here. Dwayne De Rosario – Some talks of DeRo going to Toronto for real this winter, I think it could happen but I will wait and see. Until then he is protected no matter what. 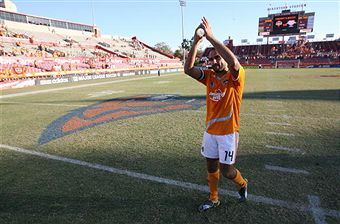 Brian Ching – Some talks about him wanting to go to Seattle, I kind of think that will happen after next year. Corey Ashe – One of the better wingers in the league, he is still young and extremely valuable to this club. Stuart Holden – Much like Ashe, he is young and really valuable. He probably is in line to replace DeRo should he leave. Bobby Boswell – Saw his career come back around in Texas. Probably one of the worst trades of the year when you think about it now. Zach Wells for Bobby Boswell. Yeah that worked out well for Houston. Tony Caig – Oddly enough they have to protect this one, he is one of their few internationals. Ricardo Clark – Defensive mids are tough to come by and Clark (when he isn’t suspended) is one of the best. Eddie Robinson – When healthy/not suspended he is one of the better defenders in the league. Wade Barrett – It would be weird to not see him in a Houston uniform. Guy-Roland Kpene – Another international that they will have to protect. Geoff Cameron – A young guy they need to protect for the future. Nate Jaqua – Word has it he wants to be left unprotected so Seattle can take him. Craig Waibel – I’ve heard some whispers about Waibel wanting to go to Seattle too. Pat Onstad – Just like last year he won’t be taken. Brad Davis – I thought about putting him on the protected list but I think Seattle already has their options with Jaqua or Waibel. Patrick Ianni/Kai Kamara – GA contracts keep them protected. Houston is an interesting bunch. Only a couple internationals to protect (three to be exact), and a few young players that anyone would love to have. Thing about a club like Houston, they will always get picked apart in these expansion drafts. Clubs will want to get players from successful clubs and that would be Houston. I may be wrong about the two that could go Seattle’s way but that’s just the stuff I’ve heard out there. However, they also seem like a fairly easy bunch to project here too. Let Seattle take Jauqa and then protect Davis. Boz is on record wanting to go the Europe so he’s another Goodson and it would be stupid to protect him. He’s out of contract and has turned down good money the last three offseason’s. San Jose has proven that any expansion team needs defenders w/MLS experience as a base (right, Toronto?). Whether Seattle takes Jaqua or Waibel will depend on what other defenders are available. No way Davis isn’t protected. He’s a good, young enough, american, naturally left footed crosser. Jaque, Waible, Ianni or Kamara will be a good player for Seattle.